Giant Santa Sack with red embroidered Father Christmas design that can be personalised with the wording of your your choice. We will professionally embroider a name or message onto this sturdy natural cotton canvas drawstring sack. The sack is very good quality and should last year after year. We will professionally embroider a name or message onto this sturdy natural cotton canvas drawstring sack. The sack is very good quality and should last year after year. This christms sack measures 60cm wide by 76cm in height and will hold lots of lovely presents. Please enter the wording you would like embroidered. This can be a brief message, full name, short name or nickname! 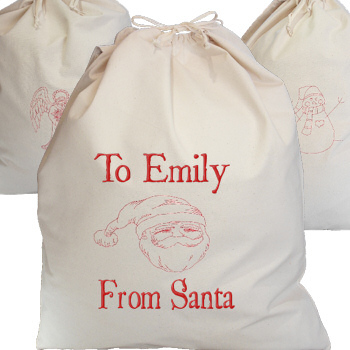 Beautifully sewn in christmas red thread to make a fantastic Personalised Christmas sack. Please note: We are unable to guarantee Next Day delivery on embroidered or personalised items, we always do our best to get the majority of orders shipped out within 72 hours.